According to Chinese astrology, my birthyear  has the horse as its zodiac sign which means whoever messes up with me will surely receive a hard kick on the face [just kidding!]. Kidding aside, I am really looking forward to finding a nice piece of horse pendant to add on my wish list. When I first laid my eyes on Roberto Coin's necklace [http://store.jrdunn.com/category_s/109.htm] that comes with a horse pendant I was striked with so much admiration. The piece is made of 18K polished white gold. 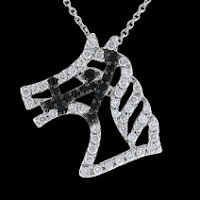 The horse pendant is designed with white diamonds and black sapphires. Amazing, isn't it? This Roberto Coin jewelry piece will surely get a spot on my wish list. This chic item is included in the Roberto Coin Tiny Treasures Collection. 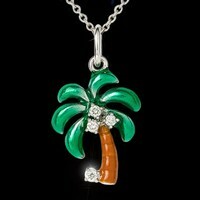 What I like most about this item is the color of the pendant [cutie!]. The tree's fruits in the form of diamonds are also brilliant! Just like the two first adorable pieces which have been mentioned earlier, this heart necklace also belongs to the Tiny Treasures Collection. If you are looking for a perfect gift for your girlfriend or loving wife, this is the jewelry to get for her. The diamonds on the pendant will surely make her day so much brighter. This piece of jewelry symbolizes elegance and sophistication. 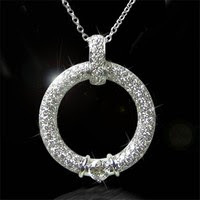 The pendant is entirely covered with diamonds --- enough to make you stand out in the crowd. To those who are into collecting fine jewelry items, This 'O' pendant is surely a "must have" for you. Diamonds, diamonds, diamonds! Are they really a girl's best friend? Could be! It's cool, right? I still haven't purchased mine. Soon.. I hope!